"Mammography screening has been promoted to the public with three simple promises that all appear to be wrong: It saves lives and breasts by catching the cancers early. Screening does not seem to make the women live longer; it increases mastectomies;1,25 and cancers are not caught early, they are caught very late.9 They are also caught in too great numbers. There is so much overdiagnosis that the best thing a women can do to lower her risk of becoming a breast cancer patient is to avoid going to screening, which will lower her risk by one-third.13 We have written an information leaflet that exists in 16 languages on www.cochrane.dk, which we hope will make it easier for a woman to make an informed decision about whether or not to go to screening. I believe that if screening had been a drug, it would have been withdrawn from the market long ago. Many drugs are withdrawn although they benefit many patients, when serious harms are reported in rather few patients. The situation with mammography screening is the opposite: Very few, if any, will benefit, whereas many will be harmed. 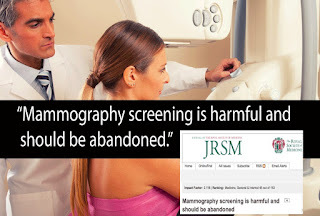 I therefore believe it is appropriate that a nationally appointed body in Switzerland has now recommended that mammography screening should be stopped because it is harmful.5"